If you have a good competitive moveset for Chandelure, post an answer below and upvote the best ones. Movesets for any of its pre-evolutions can also be shared on this thread. Chandelure Pokédex and learnset for reference. This guy is going to be one of the most important Pokemon in the metagame. Just wait till SHadow Tag chandy is released. Then it will move to its rightful home. ^ He mean OU right? With high stats all around where it is important, plus a great ability, this guy is a great Pokemon. Will-o-wisp/Toxic: Will-o-wisp makes it a better defender while Toxic is better at taing down foes. Evil Eye: Because the foe is either burned or poisoned, this STAB move will recieve "much damage." Energy Ball: Provides type coverage. Terrible move set. This would get wiped out in 2 seconds in the X and Y meta game. Flame Body would be much better, thus enabling Toxic use for Blissey. Ok if anyone has read my comment that I deleted. i dont know what i was thinking then so if anyone disagrees with my previos choice i don't blame you for those who haven't seen my comment i suggest you should stop reading this. Were that much people actually expecting a shadow tag chandelure? 2010 leak or something? Wait. It can't have shadow tag. Why is everyone saying shadow tag? eh, i have other things to take care of heatran with. i get to finish off someone before heatran comes in, and when it does i can't switch move anyway. i like the coverage against fighting types. 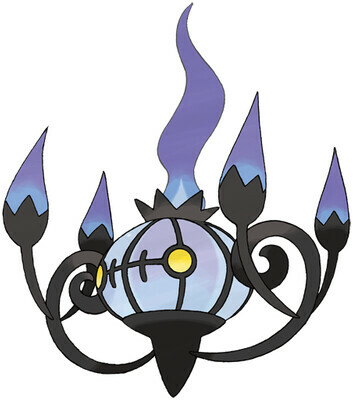 I've been using Chandelure for a long time and still am, And this is probably the best one IMO. The King of Ghosts has Spoken. Why hidden power ice? HP Fighting is better surely? Shanderaa is now the highest Special Attacker in the games, beating Alakazam. I think I would go for an all-out fast sweeper. EVs: Special Attack to the max!! Then max Speed too for sweeping. Perhaps a little in HP to boost defenses. No! you gotta love the extra power Overheat gives!! You could always give Chandelure a White Herb to reset its Special Attack. Energy Ball: Covers Weaknesses, Overall Great Move. Shadow Ball: STAB, Great Move, Covers Ghost. Items: Quick Claws for Both Sets, we need speed. Infiltrator is its HA! No Shadow Tag ever! Energy ball-covers grass and ground weakness. Shadow Ball-STAB, covers ghost weakness. Overheat-He's probably going to switch a lot, the stat drop is a small price to pay. Confuse ray/hidden power[fighting]-confuse ray if you feel risky and want more sweeping time, or hidden power fighting to cover the rest of your weaknesses. this guy doesn't have time to set up with stat boosters, he's strong enough already, so he needs to just go in head on and kill. i think you meant covers water and not grass? Team with Dugtrio. Now you have plenty of time to boost your Speed stat. When you have high enough Speed, you can then either set up Substitute to protect against Sucker Punch (the biggest threat) or you can choose to go for the Heatran and Blissey KO with Calm Mind. Shadow Ball and Hidden Power Fighting get perfect neutral coverage. Are u Kidding flame charge On the worst attaker in black!??!?!?! Flame-charge is not for damaging, it is for boosting his Speed stat. Think of it as a mini-agility. The saddest of all movesets: Physical Chandelure. Yes, you must be like, what are you thinking, he has 55 base Attack! Well check this out, it actually works. Shadow Tag is a huge part of this combo and you will see why. Swagger raises by two stages the foe's Attack and confuses. I normally switch into Blissey or Chansey, as they cannot do a single thing while i keep using Swagger. I then use Psych Up to copy all the Stat raises. Flame Charge is to correct his low Speed and is STAB. The last moveslot is all up to you. Astonish is a terrible move but is some Ghost STAB. Frustration and Return do some decent damage. Payback is just some normal damage. Giga Impact hits tremendously hard but there is that recharging that's very annoying. Last but not least, you could use Substitute on him for blocking Status. Life Orb is the preffered Item for hard-hitting but Lefties can be used for healing the damage that you receive. P.S: What ever you choose in the last moveslot, Heatran is the best counter. If you choose Substitute, he completely walls you. Fortunately, he is rare in DW Ubers. Lol, it's a semi-gimmick set, it kind of helped me sweep a guy, but I doubt it's very reliable. Counters that are used in uber, Giratina (Normal for last slot), and Tyranitar for both. daEpad you must include what evs to train in and items. Shadow Ball is STAB and has accuracy definitely reliable. STAB Fire Blast hits ridiculously hard coming off of Chandelure's base 145 Sp.Atk stat, And Life Orb boosted. Energy Ball is used to hit water and rock types, Mainly. Completely destroys Gastrodon and the likes. Hidden Power Ice hits Dragons for super effective damage, But doesn't really have any other use outside of that. Pain Split works well with Chandelure's good base 90 defenses and "eh" 60 base HP stats. Hahaha, Quiet nature doesn't increase Sp Attack and lower Attack, that is Modest! sorry about that, i edited it a little here in the answer after making it on PO. Flamethrower / Overheat: Obvious stab, but flamethrower is for the timids who cant take the stat drop. Psychic: For fighting types; some fighting types can learn stone edge, a key weakness to chandelure. This move cripples them. "I didn't know chandeliers could move so fast!" Toxic - Badly poisons foe, goes well with Hex. Hex - Works well with toxic/ability. Curse - Takes half your HP away, but casually damages the foe. He's talking about Eviolite Lampent.